A. Before installing the detachable towball you must be sure it is in the `set` position. This can be seen from the color in the indicator window of the operation handle: this should be `red`. If this is not the case then push in the operation handle firmly to the end and then rotate the Handle - while keeping it pushed in - fully clockwise to its end position. The handle now will remain in this (`set`) position (see diagram 1). B. Remove the plastic weather cap and ensure that the housing is clear of any mud, gravel, road debris, i.e. Insert the detachable towbar into housing and move it up until the triangular pins are set into the corresponding recesses (left & right) of the housing (refer to diagram 2). While inserting the detachable towbar into the housing keep your hands away from the operation handle. Next, pull the ball itself towards you while holding the towbar in the above position, i.e. triangular pins resting into their corresponding recesses (left/right) in the housing. The system then will automatically lock and the operation handle will turn to indication green and will also pop out about 5 mm (refer to diagram 3). CHECK THIS ! Always check the indicator window in the operation handle shows`green` every time before you start towing, as shown in diagram 3. If this is not the case, remove the towbar and start the mounting process again at point `A`. C. The key operated lock is an anti theft device only. It is not involved with safe attachment Of the detachable towbar. It is safe to tow with the key operated lock unlocked as long as the towbar is correctly attached as described above. D. Lock the towball by turning the key clockwise ½ a turn (refer to diagram 4, 5). Remove the key, after this the operation handle can no longer be pushed in and not be turned enough to activate the mechanism. If the towbar can be locked this also confirms that the towbar is correctly installed. It is essential that the indicator in the handle shows `green` prior to towing. Remember to remove the key from the lock before starting your journey. 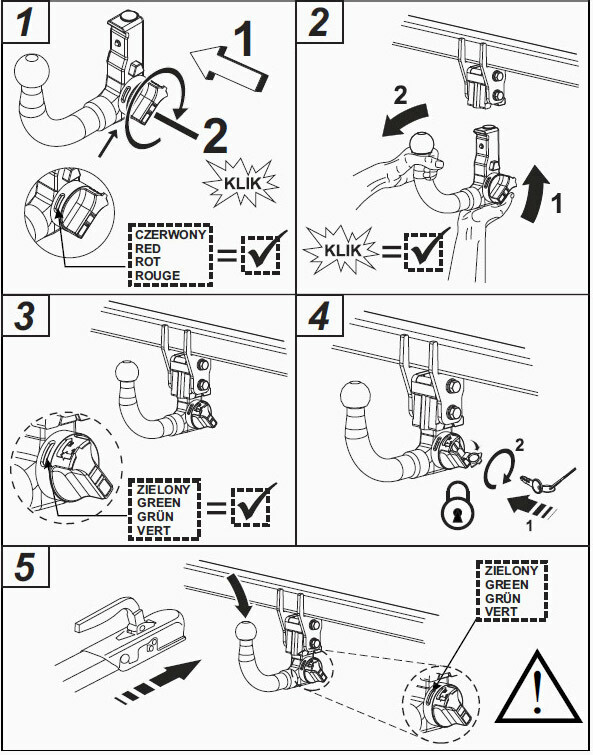 The towbar is then ready to be used (refer to diagram 5). A. 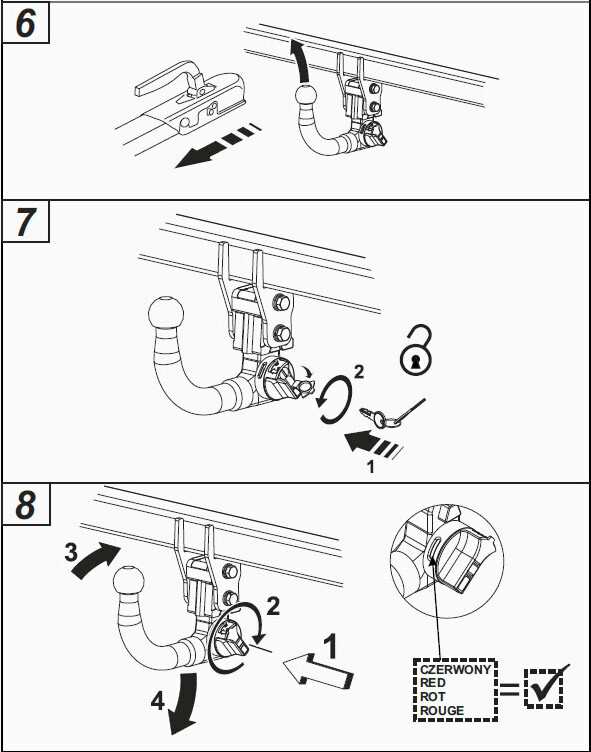 Always remove/unhitch the trailer prior to removing the towball (diagram 6), and remove any accessories if they obstruct the locking system as well as detaching the safety cable. B. Unlock the towball by turning the key anti-clockwise ½ a turn (refer to diagram 7). C. Hold the detachable towball with the left hand. Push the operation handle fully inwards and then whilst holding it pushed in turn the handle fully clockwise to its end position. The handle will remain in this position (refer to diagram 8). D. Let the detachable towball slide out of the housing while holding it in your hand to prevent it from falling onto the floor. E. After removal of the towball the plastic weather cap should be attached to the housing. F. When not in use keep the towball in safe, clean and dry place. If kept in the vehicle this must be located such that it is not free to enter the passenger compartment in the event of heavy braking, heavy cornering or in case of an accident.